New York residents living in rent stabilized apartments won the city's first rent freeze on Tuesday after 7-2 vote by the Rent Guideline Board, RGB, in favor of a freeze. The freeze decision favors one year leases with zero rent increase, while two year leases are expected to pay 2 percent rent increase. News reports say that the decision will affect new leases and lease renewals from October 1. 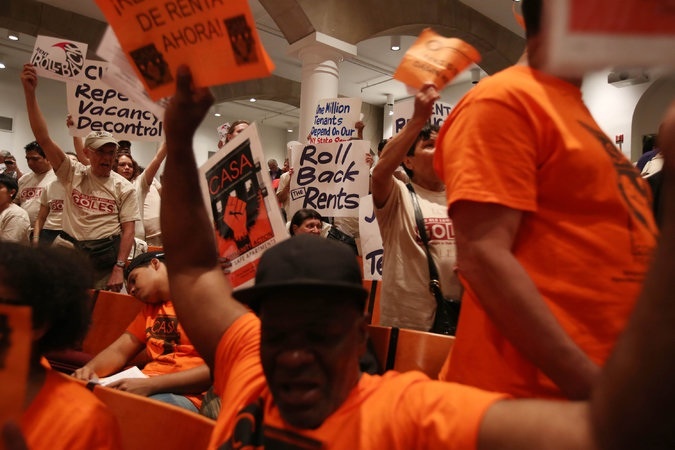 It is not unexpected that the Rent Guideline Board's decision heralded jubilation among members of Rent Justice Coalition and a group of tenants, who were at the venue of the RGB meeting and who witnessed the announcement of the the board's decision. The decision seems like a score for Mayor de Blasio, because according to reports all the current members of the RGB are his appointees. The mayor and other New York City Council members hailed the board's decision. But landlords' representatives said the decision will ultimately hurt tenants since 'they' the landlords will not have sufficient funds to maintain the buildings. For residents, the decision represents a breather from the burden of rent payment. Many renters believe that New York City is one of the costliest places on earth to live in term of high rents. The complaints have been that after paying rents, residents have virtually nothing left after paying other bills. Yet, they say rent has been increasing astronomically over the years and the landlords have been beneficiaries, while renters have almost been squeeze out of existence. Many observers actually see the current freeze as a drop in the ocean, because they expect much more than they have got. For example, some of the placards at the Cooper Street venue of the RGB meeting on Tuesday night reads, " Wanted: Rent Reduction" a reflection of the mind of most New Yorkers. The reason is clear because for 46 years, the landlords have been reaping benefits of their position without winking an eye,while the tenants have been crying, at time loud and silent, but no one seems to listen to their cries. About 12 years ago, it was possible to get one bedroom apartment for $700.00and a kitchenette apartment ten years ago for $750.00. Today,a one bedroom apartment goes for $1400.00 and the kitchenette apartment rivals the one be dorm at almost the same price, while the two bedroom attracts close to $1800.00. A renter who vacated a kitchenette apartment in a rent stabilized building in Brooklyn few months ago, where he moved in about 10 years ago at $750.00 a month said he was shocked when the buildings Super told him that the landlord planned renting the apartment at $1400.00. He said that when he asked the Super if there would be any tenant who would take the apartment for that price, the Super said people moving from Manhattan to Brooklyn because they could no longer pay the high rent in Manhattan would compete for the apartment.